This is the most efficient sequence for Model-Code Modular (Factory-Built) homes that arrive on removable trailers (If trailers span the full width of home units, a crane must be used, and the panels must be pre-set. See note below.). Homes built with an attached chassis can setup, and the foundation panels install, the same way as HUD-Code homes. Note: Panels can all be set with a guide-board and cast into concrete before arrival of the home. While more efficient than a conventional perimeter, this is not as efficient as the method described here, and can suffer the same mismatch problems that typical foundations have. Concrete is placed in the perimeter footings. After it has cured, the temporary supports are removed. Backfill to suit. Panels are hung around the in-place units, just as for manufactured homes. Alternatively, panels can install and cast in concrete around 3 sides of the home while it is supported on the trailers, and the 4th side installed after the trailers removed. Set the home units in place with lines of temporary support near the outer edges (see detail on the other side of this sheet). Trailers then disengage from the homes. It may be necessary to first let air out of the tires or remove the axles to lower the trailers and get them out. 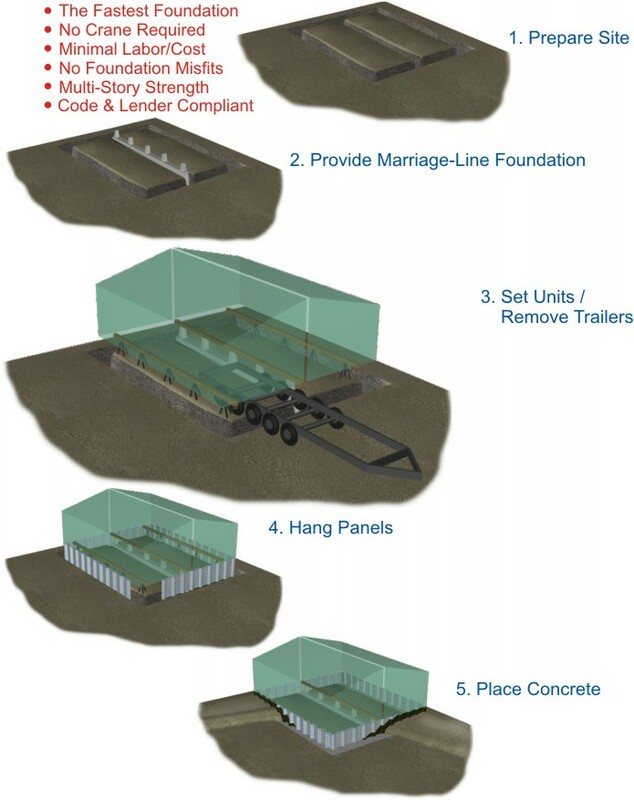 Construct the permanent foundation and support along the marriage line(s). This needs to be stable enough to support the each home unit before the perimeter foundation is completed. Prepare the site per requirements of the home manufacturer and the local building codes.